Compass’s liability for high-value items is limited to $100 per pound. But for items that exceed that in value, Compass offers a simple, stress-free plan of protection. Basic Liability Protection provides repair or replacement up to a maximum of $0.60 per pound per article should your goods get damaged or lost. Keep in mind, though, when it comes to protecting your belongings, one size does not fit all. The level of protection you need may be greater than minimum levels based on your total shipment weight. Be sure to consider high-value items such as artwork, electronic equipment, crystal and porcelain collectibles. Basic Liability Protection is free of charge with your move, but YOU MUST request this moving coverage in writing. Travel Guard Insurance (TGI) – Optimal Household Moving Coverage from TG INTERNATIONAL INSURANCE BROKERAGE, INC. Compass offers you total peace of mind with Travel Guard Insurance (TGI), the most comprehensive protection plan in the industry. TGI covers the cost to repair or replace, whichever is less, any household item that is damaged, lost or destroyed. Though our goal at Compass is to be claims free, we know accidents sometimes happen. Should you experience damage to your personal property, please accept our apologies for your inconvenience and allow us to assist you. We would like to extend our apologies for any damage that may have occurred during your move. 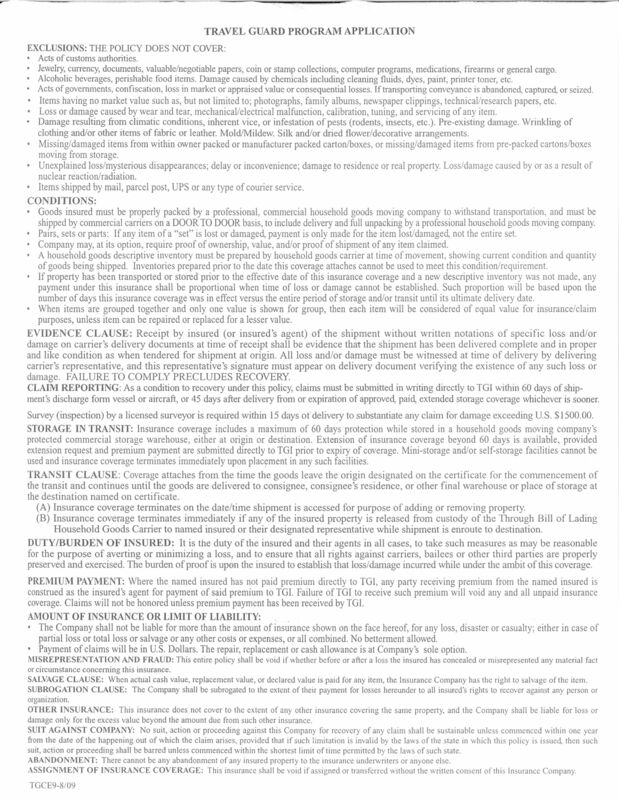 Documentation regarding the loss of and/or damage to items in the shipments moving through the Defense Personal Property System (DPS) is required by the military to be reported through DPS. On the official DPS portal, you will find helpful information regarding how to file your claim. Compass isn’t just your average moving company. We’ve been moving families to and from domestic offshore locales for three-plus decades. We want your business and for you to have the utmost confidence in giving it to us. CLICK TO LEARN MORE!